I made my first visit to Las Vegas last week, and I don't plan on returning anytime soon. The exception would be if someone offers us tickets to see another performance by Santana at the Hard Rock Hotel, which was the high point of our trip. The show is called Supernatural Santana: A Trip Through the Hits. The title is an allusion to the group's 1999 album, Supernatural, which won nine Grammy Awards including Album of the Year. It's also fitting given Carlos Santana's apparent fixation on mysticism and spirituality that falls just a wee bit outside the mainstream. More about that later. 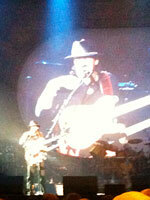 Our seats were dead center, nine rows back from the stage, and afforded a great view of the proceedings. I had an immediate regret for not bringing my camera; I didn't expect that cameras would be allowed, but people were openly shooting photos and video throughout the concert. I took a few pictures via my phone's camera, but the quality is not good. Still, you can get a sense of the stage setup. Click on each photo to get a bigger version. The third photo above shows Carlos with his double guitar setup. If you caught his live performance of Maria Maria on Dancing With The Stars last season, it will be familiar to you. Not being a guitarist, I couldn't tell you why he uses two instruments on that song, but I can tell you that the results justify the means. The next surprise came when Carlos announced that several of the band members, including himself, had been dealing with bouts of bronchitis. As a result, he did almost no singing, but that proved to be no hindrance to our enjoyment of the music whatsoever. In fact, Carlos's strength has never been his vocals, but he does know how to surround himself with gifted musicians, and the current lineup was amazingly talented. This is an All Star band, without question, and each member has a deep and impressive resume. There were two lead vocalists, Tony Lindsay and Andy Vargas, each with different-but-complementary styles. The trumpet player, Bill Ortiz, and trombonist, Jeff Cressman (who looks like a high school science teacher but way cooler) were not relegated to background sounds but had frequent and impressive solos. The keyboardist, Dave Mathews (no, it's a different one) had biceps like a longshoreman, and the bass player, Benny Rietveld, grinned nonstop through the entire 2+ hour performance. 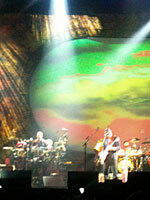 Santana has three percussionists: Raul Rekow on congas, Dennis Chambers on trap set, and Karl Perazzo on everything under the sun. The other guitarist and backup vocalist, Tommy Anthony, had a mobster vibe going along with a surprisingly pure tenor voice. And, of course, Carlos Santana fronted the whole group, perpetually moving around the stage, acting as maestro but never demanding the spotlight. Carlos was born in 1947, and he's never tried to be younger than he is, but you couldn't tell his age by listening to his guitar playing. His fingers are as nimble as ever. One of the things I've always liked about Santana is the variety of the music. Sure, it's always got a Latin-tinge, but genres don't mean much to the group. One of my favorite songs of the night was a 70s-style funkfest, with each member of the band showcasing his talents. Then, completely out of left field, they do a rendition of She's Not There, the 1964 hit from The Zombies, featuring Tommy Anthony on vocals. 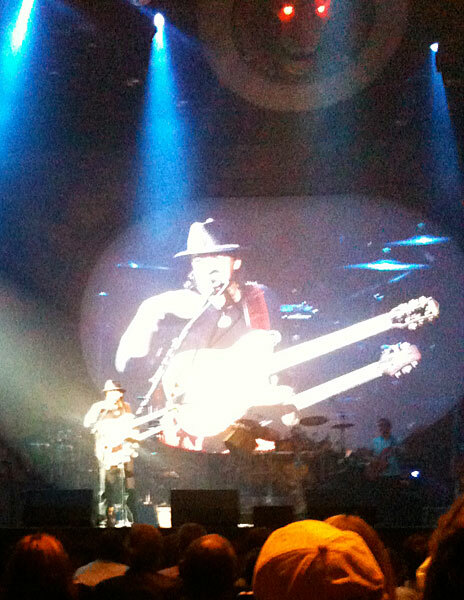 Of course, they also played all the classic Santana hits, from Black Magic Woman to Oye Como Va to Smooth. After the concert ended, the obligatory standing ovation brought the band back on stage where they picked an odd selection for their encore: Soul Sacrifice, the song featured in the Woodstock movie. I say "odd" not because it's not a great song, but bands typically don't save their longest pieces for the very end of the concert, when they're already worn out. (Perazzo in particular was visibly dragging by that point.) But it was evident that these guys love what they're doing, and they really like working with each other. Their enthusiasm for the music was perhaps even more attractive than their considerable talents. There were only a couple of weaknesses in the overall experience. First, either the sound tech was continuously rotating the master knob toward 10 or our ears were just hammered into submission, but the music seemed to get louder and louder through the evening, to the point where it was actually painful in a few places. (I know; if the music's too loud, you're too old.) Second, Carlos really needs to stick to playing music and skip the preaching. At one point while introducing a song he rambled on about the equivalent of rainbows and unicorns past the point of comfort. On the other hand, he's never been shy about his spirituality, so I guess it just comes with the territory. And, of course, I'd have been perfectly comfortable if he'd been sharing a message of Biblically-correct Christianity, whereas I suspect that would have had many others in the audience wriggling in their seats in dismay. 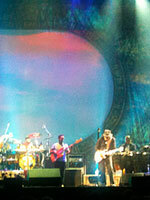 The bottom line is simple: if you're a fan of Santana, or of Latin-flavored rock, this show is a must-see. Performances will continue at the Hard Rock Hotel in April and May, and it's a better excuse than most to make a quick trip to Vegas. You won't be disappointed. This page contains a single entry by Eric published on January 20, 2011 3:46 PM. Random Thursday - The Truncated Edition was the previous entry in this blog.